"If you like guitar playing, it simply doesn't get any better than Tommy." 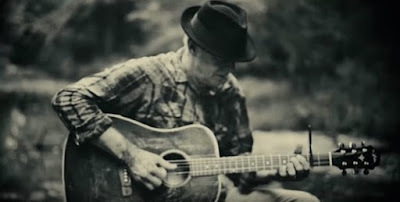 Tommy Emmanuel--the esteemed Grammy-nominated guitarist, composer and performer--has partnered with Cowboys & Indians to premiere the video for "Deep River Blues," his collaboration with Jason Isbell from Emmanuel's acclaimed and high-charting ACCOMPLICE ONE album. The song is a stirring interpretation of the country blues classic by the late Doc Watson, whose birthday was March 3. Watch the video below, directed and edited by Joshua Britt and Neilson Hubbard. It features Emmanuel, with muddied hands, finger-picking his acoustic guitar by a small creek in the backwoods of Nolensville, TN and celebrating Watson's pioneering guitar style. "Firstly, Jason was an obvious choice for 'Deep River Blues' as he's from Muscle Shoals [Alabama] and has the exact vocal style I was looking for this style of song. I have been a Doc Watson fan since I first heard him in the early '70s. Doc and I did some shows together about 10 years back and he was a great gentleman to be around. I think his influence was the fact that he always stuck to his way of doing things and never got swayed by trends." Tommy Emmanuel--whom is distinguished as one of only five musicians handpicked by his mentor, Chet Atkins, as a Certified Guitar Player (CGP)--earned the #1 "Bluegrass Album" on the Billboard charts with his ACCOMPLICE ONE collaborations album, released January 19 via CGP Sounds and distributed by Thirty Tigers. The album also debuted in Top 5 on Billboard's "Heatseekers Albums," Top 15 on "Independent Albums" and Top 20 on the "Americana/Folk" chart alongside its #1 debut on the iTunes "Jazz Albums" chart. The road warrior has an extensive worldwide touring itinerary already confirmed for the year, with more dates being added. On select upcoming U.S. tour dates, Emmanuel will be joined by ACCOMPLICE ONE special guests such as Amanda Shires, Jerry Douglas and Suzy Bogguss. See all upcoming tour dates here. "With him, it's all human." "Tommy is a force of nature...I wondered how I could keep up with him!" "Tommy is one of the most musically welcoming artists I know!" "Tommy is my favorite acoustic guitarist in the world."